Japanese encephalitis (JE) was confirmed in Myanmar since 1974 and sporadic outbreaks have been reported. A descriptive study was conducted to determine the epidemiological characteristics of JE among acute encephalitis syndrome (AES) cases during 2014-2016 and identify potential risk factors for JE infection. The reported AES cases increased from 252 in 2014 to 1,911 in 2016. The annual proportion of JE among AES cases were 22.1-22.6% during 2014-2016. The highest proportion of JE among AES case was found in Rakhine State (44.6%) in 2016. Proportions of JE among AES cases were high in the rural areas, and in children aged 1-14 years. None of AES cases had previous JE vaccination prior to onset. JE infection was confirmed in 53.4% of serum and 47.0% of cerebrospinal fluid specimens obtained 3-7 days after onset of illness. In multivariate analysis, people aged one year and above, living in rural areas (Adjusted odds ratio = 2.9, 95% CI = 2.2-4.0) and having chickens and/or ducks in/nearby house (Adjusted odds ratio = 1.4, 95% CI = 1.0-1.9) were significantly associated with JE positivity among AES cases. An effective immunization campaign should be implemented nationwide, with prioritization given to the most affected areas and those aged 1-14 years. THAUNG, Yamin et al. Epidemiological Features of Japanese Encephalitis among Acute Encephalitis Syndrome Cases in Myanmar, 2014-2016: Implications to the Vaccination Program. OSIR Journal, [S.l. ], v. 12, n. 1, p. 24-31, mar. 2019. ISSN 2286-8933. 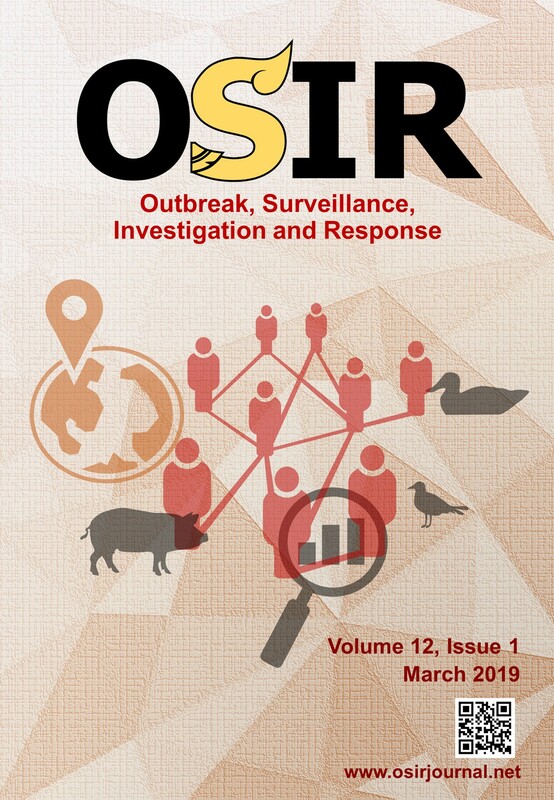 Available at: <http://osirjournal.net/index.php/osir/article/view/137>. Date accessed: 25 apr. 2019.